The 9th Field Operation took place for a period of three weeks, starting from August 24th. During this period, we carried out several activities, mainly focusing on the following two. One activity we focused on was the implementation of our main project, “Movement with Gangsters.” We have hosted the sixth semiannual program session during this field operation in Nairobi, Kenya (For more information on this project, please visit：here). Based on past project evaluations, we were able to improve the contents of this activity. Not only did we focus on the positive reintegration of youth gang members into their surrounding community, but also the prevention of their further radicalization. In this session, the youth gang members discussed topics revolving around themselves, such as drug issues surrounding the community and the lack of basic education, as well as possible resolutions for each problem. After coming to a conclusion that the discrimination from society is the core reason preventing their reintegration into society, the participants suggested that they host a youth conference in which they invite people from the community whom are aged similarly to themselves. This provided an opportunity for the invitees to see the participants' true self including their hardships, as well as cooperating to resolve the problems as "youths." On the day of the closing ceremony, we invited individuals whom may become the participants' role-models. Also, from this session, we hosted life-skill courses where the participants were given speeches on how to live life as a youth, and not as a gang member. The other activity we focused on was filming the documentary. We continued the film-making process, which started the summer of 2015. This documentary was proposed by a participant of the fifth project session, aimed towards the "reduction of discrimination and prejudice from society against youth gangs.” More youth gang members were filmed, as well as civilians, staff members of both local and international organizations, and university professors. The civilians told us their impression of youth gangs in the community, and how their situations can be changed. Thanks to everyone's cooperation, we were able to film very valuable components of the documentary. The documentary is in creation, and we cannot wait to air the completed film soon! We will report the details of this field operation in the "9th field operation report" that is to be carried out on Sunday, November 13. Further information will be provided via the homepage and other social networking services, so please be on a look out for them! On Saturday May 21st, we were able to hold the “8th Field Operation Debriefing Session” at the Yotsuya Community Center in Japan. We gave a report regarding the process and achievement of our main project, “Movement with Gangsters,” screening part of the documentary film we are currently creating in order to lessen discrimination towards Somali youth gangs, and other projects we have gone on. On the day of the event, approximately 50 people showed up at our door. If this debriefing session gave a chance to look at Somalia from a different perspective in that even students can take part in changing the world’s most dangerous place for the better, that would mean so much to us. The making of this documentary began during the last field operation as part of our “Movement with Gangsters” project. Requested by the gangs, the creation of this documentary began in order to showcase the reality of the on-going discrimination against them by the society along with raising awareness in order to reduce those actions. By including the voices of society, we managed to include various point of views, overall improving the quality of the documentary as a whole. Thanks to the active involvement of the gangs, we were able to further advance the making of this documentary. The interactions of ideas with past participants, Somali members, Somalian and Kenyan NGO workers, and scholars who profession in public peace and security that we had been working on as part of our preparation process had officially been finished. Keep an eye out for our 2nd generation “Movement with Gangsters” project, which has become more powerful with the inclusion of a new purpose – prevention of further radicalization of gangs. Further details will be available here. News from “Nadeshiko Japan x JSYO ~Peace to Somalia through football~”, the project we started in February. Somali members of our organization have safely delivered the sport shoes gifted by Rumi Utsugi, a member of Japan women’s national football team, to Somali refugees. This project is a part of “Cheer up Somali Sports Project” aimed at building relationship between civil societies of Japan and Somalia through sports. Rumi Utsugi, who is active at the forefront of the world as a member of Japan women’s national football team, gifted her sport shoes to Somali refugees. It was the fact that Rumi Utsugi sympathized with our organization’s strong wish to build peace in Somalia through sports. This time Somali members of our organization delivered shoes to schools and sports centers in areas where Somalia refugees live in Kenya. After receiving the shoes, school students and youth team members wore them and played football all together under the blue sky. Ms. Utsugi was also very happy to know about the shoes being delivered. “This is just a little help, but I hope it will let Somali people spend at least some time in peace” she said. You can also access Rumi Utsugi official website to see photos from the project site and information about this project. Japan Somalia Youth Organization will continue its contribution by taking action, as we understand the importance of international cooperation through sports. Yosuke Nagai, the president and Co-Founder of JSYO, was chosen one out of 30 candidates in the programme, “Kruger Cowne Rising Star Programme in association with Xcor Space Expeditions and One Young World”. In this programme, he is the only Japanese candidate. Click here to visit official site of the programme. In above the site, not only his profile but also his video are being released. This election approved the establishment of JSYO and our positive activities for the peace-building in Somalia with strong will to take actions toward the disordered state. It is also a great pleasure for other members. We JSYO would like to thank for the election, and it gave the other members opportunities to reconfirm the importance of responsibilities for our activities. We will keep making progress for Somalia with our core idea, 'Realization’ as the only international NGO taking action for Somalia. Yosuke Nagai,the president and Co-Founder of JSYO, was chosen and won “The Ono Azusa Commemorative Special Award In Waseda University” on March 25th in 2015. This awards are given to students in Waseda University who have achieved outstanding grades in specific three fields (academic, art, and sports) . The prize given to Yosuke is called "Special Award," especially awarded to students who have done great works in other than the fields above. “The Special Award” approved the establishment of JSYO and our positive activities for the peace-building in Somalia with strong readiness to take actions toward the disordered state. It is a great pleasure to get it for both Yosuke and other members. We JSYO would like to thank for all of your support and deeply appreciate your understanding our activities. We will keep making progress with our strong sense of responsibility to run the front of Somalia's peace-building. From 10th to 26th March, JSYO implements 6th Field Operation in Nairobi, Kenya, where many refugees from Somalia live. The main purpose of this time's operation is to implement "the 4th Movement with Gangsters." In this time's M/G, we aim at making the chance for Somali Youth Gangs to get meaningful skills toward their reintegration. In order to achieve that, we have negociated with many local NGOs. In the project, the gangs themselves will ask the NGOs to provide them some skill trainings. Between 10th and 26th March, 4 Japanese members stay there, so if you have an idea of cooperating with us, feel free to ask us anytime. Yosuke Nagai, the president and Co-Founder of JSYO, won The General Grand Prix Award in "STUDENT OF THE YEAR 2014" on December,2014. These prizes are annually awarded to the college students who are doing prominent activities under the revolutionary ideas especially in the 4 fields, Business, ICT, Entertainment, and Non-Profit. 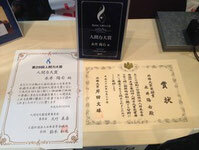 Yosuke's winning of the Grand Prix among the many active students in Japan means JSYO's activities are approved as epoch-making and promising ones. It is a great pleasure to get this splendid award. We JSYO would like to thank for your warm support and cooperation with us, we deeply appreciate your kindness. Yosuke Nagai, the president and Co-Founder of JSYO, was chosen and won "The Ten Most Outstanding Young Persons Award in Japan", a National Honor Award for people aged 20-40 years, and "Incentive Award of the Minister of Foreign Affairs of Japan" in July 2014. Those awards are given to prominent young people who are actively performing in various fields. Receiving these prizes reveals how much his work has been applauded and how JSYO’s activities have been approved by many people in Japan and the world. It is a great pleasure to inform you that these splendid awards were given to Yosuke, and we would like to thank for your warm support. We deeply appreciate your kindness and understanding our activities. We’ll keep making progress for Somalia with our core﻿ idea, ‘Realization’. We participated in the supporting recovery from ‘Great East Japan Earthquake’ project, called “－One million people’s－ FLOWERS WILL BLOOM,” held by NHK (Japanese state-run broadcasting station). Responding to JSYO Somali members’ strong wishes to do something for the sufferers from the Great East Japan Earthquake, we took part in the project and made a music video by singing a Japanese song, “Hana Wa Saku(“Flowers Will Bloom” in English) with Somali members and local Kenyan people during the JSYO's 4th Field Trip carried out on March, 2014. We are praying the suffering people could be cheered up through watching this video. On May 11th, there was an event to welcome new students at JASCA. Over 1400 people came, and recorded as being the biggest event for new comers. Nagai appeared on stage at Global Festa 2013 main stage! Nagai, on the main stage of the Global Festa, asked to the international organizations that gathered around what a student can do or is capable of doing. He answered to his own question, "you can simply do anything and everything because you are a student" which motivated several individuals (especially students) to take action and be part of a supporting organization. The operation used part of the donations (970,000Yen) and implemented it to the project held by the organization which was the third time of local travel activities. Held Waseda University Community Center (ICC) sponsored event "Somali cafe-Somalia conflict areas, - reality, hope -"
The Second Visit to the Somali Residential Area in Nairobi, for the project implementation in the field cooperating with the Somali Members. The First Report Session of JSYO; Researched the Somali residential area in Nairobi including having sessions with local actors. Many were pleased to visit and a number of individuals applied to the new member seat as a result. Requests for the Report seemed to be endless. The First Visit to Somali residential area in Nairobi. Met with Somali Members and had a glimpse of the area. We were able to know what is needed and what we can do to support them. JSYO established cooperative partnership with Somalia Re-life Organization.